ACH / Himilo is committed to safeguarding and promoting the welfare of our learners and tenants. It is our expectation that all staff, volunteers and members of the school community share this commitment. 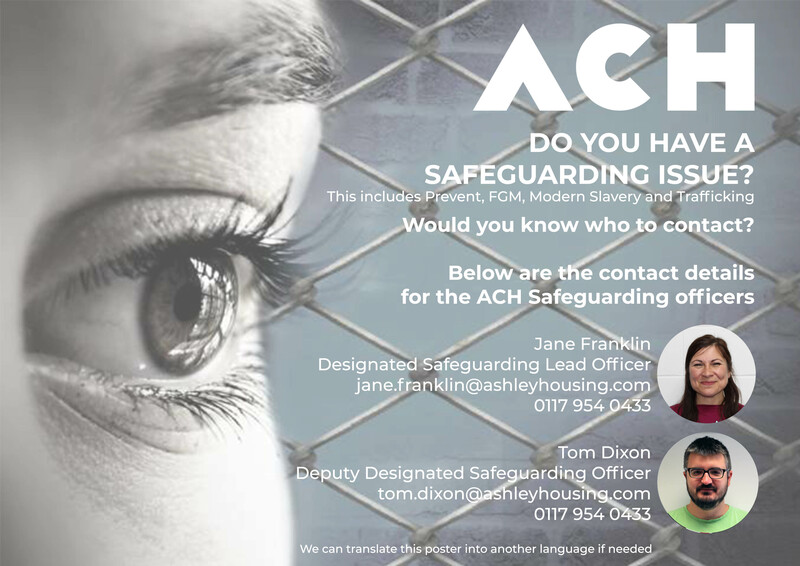 Should you have any concerns relating to the safety and welfare of an ACH / Himilo learner or tenant you should immediately contact the Designated Safeguarding Lead Officer, Jane Franklin or, in her absence Tom Dixon, the Deputy Designated Safeguarding Officer. Should you have any concerns in terms of safeguarding relating to the behaviour of a member of staff, you should immediately contact the designated person as above. If the allegation concerns these individuals, you should contact: Andy Burkitt, Chair. Everyone who comes into contact with learners and tenants has a role to play in safeguarding them. ACH / Himilo staff receive regular training to help them to identify concerns at an early stage. Prevent is part of the United Kingdom’s counter terrorism strategy. It aims to prevent people from becoming involved in terrorism or supporting terrorism. At ACH / Himilo, the Prevent strategy is part of our wider safeguarding duties. We have a duty to protect learners and tenants from radicalisation and extremism.